Experience massive workstation power with support for 145W processors powering up to 36 cores in a dual Intel® Xeon® processor configuration3. And take your productivity up a notch with the ability to do more thanks to professional graphics from NVIDIA and AMD10 and support of up to 8 displays10 on one system. 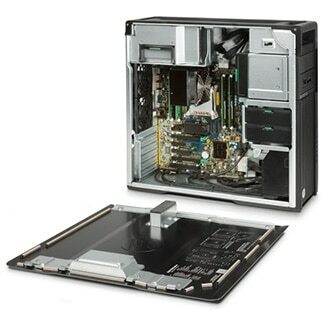 The HP Z640 Workstation uses Z DNA to provide a high-end workstation experience at a mid-range price point. Build the perfect workstation for your needs. 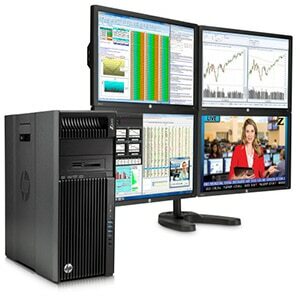 The HP Z640 Workstation, featuring Windows 8.11 or Linux, provides incredible expansion in a small footprint. Get the storage, performance, and freedom you need to create with up to 8 memory DIMMs, up to 4 internal hard drives, and built in USB and SATA ports. With the innovative HP Z Turbo Drive10 set a new performance curve as you revolutionize how you handle large files and reduce boot up, calculation, and graphics response time. And thanks to Thunderbolt™ 13 technology, you'll transfer data at lightning-fast speeds with the ability to connect to high-resolution displays and high-performance data devices over a single Thunderbolt™ cable. Concentrate on your work using a workstation that is whisper quiet. The tool-free chassis of the HP Z640 boasts low acoustics, a single integrated Gb Ethernet, front and rear handles, and is 4U rack mountable—all in a conveniently compact design. 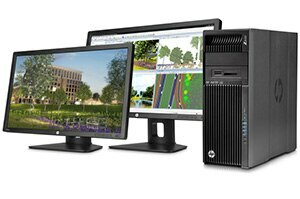 And optimize your HP Z640 for peak performance with HP Performance Advisor14, your own personal system engineer, which automatically configures your system with updated settings and drivers to help maximize performance.